I hope you are all doing well. Can you believe that the holidays are right around the corner? Next week is November, and before you know it, Christmas will be here! YAY! 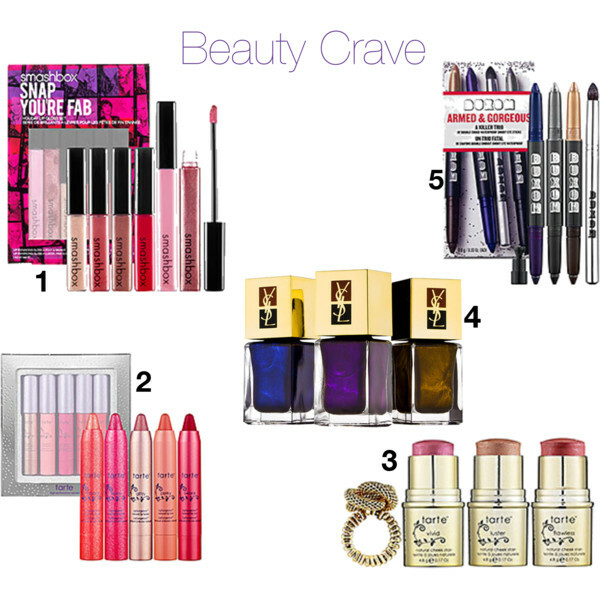 For this edition of beauty crave, I wanted to share with you some awesome beauty gift set ideas. I love the holidays-especially because that's the time that most of our favorite beauty brands release special, gift sets that are just to die for. Let's get started! 1. Smashbox Snap You're Fab Lip Gloss Set ($30.00)- I LOVE Smashbox lip glosses. They go on smooth, and they give my lips a gorgeous shine. The best part is that the glosses feel so comfortable on my lips. This set includes four travel-sized glosses, as well as two full-sized glosses. Score! The colors included in this set are right up my alley as well. I am glad that a full-sized version of Pout is included (soft pink) because it is one of my favorite Smashbox lip glosses. 2. Tarte Lip Service Lipsurgence Collection ($29.00)- I have noticed that this Tarte lip set has been generating quite the buzz in the beauty blogging community. I can see why. Not only is this lip set from Tarte paraben free, but the variety of colors are just lovely. I love new lip products, and this is definitely a product that is on my beauty wishlist. I am sure it performs as great as it looks! 3. Tarte Ring It In Cheek Stain Set ($25.00)- Here is another lovely product from Tarte. This time it is the paraben free, cheek stain set. I really like the luxurious gold packaging, and the inclusion of a cocktail ring is a great surprise that I am sure nobody will be able to resist. 4. Yves Saint Laurent Holiday Nail Trio ($45.00)- If the gorgeous packaging, and shades aren't enough to make you drool over these limited edition, Yves Saint Laurent nail color set, then I don't know what is. These luxurious metallic, jewel-like colors just scream holidays. The three shades included are No.126 (Black Bronze), No. 127 (Black Lapis), and No. 128 (Black Indigo). 5. Buxom Armed and Gorgeous ($29.00)- These double-ended eye sticks are a great bang for your buck. You are getting six lovely vibrant looking colors, and that blue color is calling my name. I can already picture the different looks that can be created with these colors. I am pretty sure that these eye sticks are great multi-taskers as well. They can be used to line the eyes, alone and blended out as a wash of color on the lids, and as a base color. I love that these eye sticks are paraben-free, and that included in the set are also a handy sharpener, and a smokey eye brush. What beauty gift sets are on your wishlist? :) Have you tried any other products from Tarte? I am dying to try their blushes.